One of the questions we get a lot, especially when we are traveling, is how we stay motivated with working out. Trust us, we have our days when the last thing we want to do is workout or eat healthy. Since we have been living a healthier lifestyle for about 6 years now, it has become second nature to us. We usually wake up and want to workout and make healthier choices. Staying active and working out is just something we love doing, and it just makes us feel better overall. It could be going on a hike, a walk, a run, or going to the gym, but if we don’t do it, we feel just “off”. Before we get into our tips, we wanted to share this super cute workout look that we live in! These crops are so fun, and the mesh and colors make it even better! This tank goes perfectly with them and it is great for working out and comes in a bunch of colors. 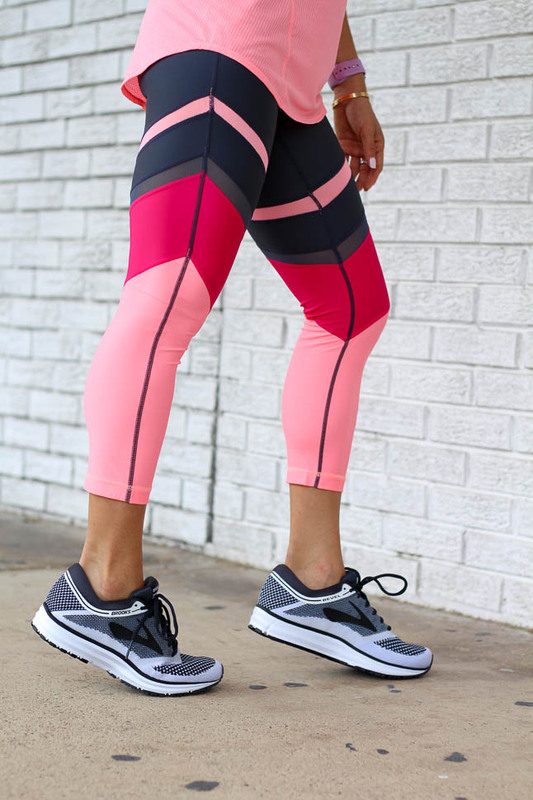 These shoes are great for running and we love that they have a flyknit texture, which we love and they are SUPER comfy! If you sign up for a class or make a workout “date” with one of your girlfriends, you will be held accountable, and less likely to miss it. We don’t always workout together, but if one of us is getting up really early to workout, the other one of us is more tempted to get up as well! For us, and even since we were younger, a new workout outfit would get us motivated and excited to workout. Our mom would entice us to do a sport like tennis or gymnastics solely based on the outfits, haha. Even to this day, a fun pair of shoes or a sports bra gets us motivated. If you don’t come prepared, you will not stay on track. We know when you’re on vacation, it can be difficult to get yourself to the gym, but once you start your day off with something active, you will feel so much better, and not feel like you fell off the wagon when you get home. This is probably the most important thing. Once you make working out and eating healthy a lifestyle, it will become second nature to you. You will actually want to get up in the morning and workout. It sounds cliche, but it is so true! When we first started working out, we used to browse pinterest, youtube, and instagram for workout ideas and healthy meals. We have shared a lot of workouts here, but you can also check out this post on the Fit Body Guide, which we highly recommend! Setting goals is super important, and may seem kind of silly at first, but once you reach a milestone you set, you will feel so much more accomplished, and want to continue! For example, setting a goal to workout 2 or 3 times a week, running 1 mile, doing 15 minutes of cardio a day, etc. A great way to stay on track and keep going is to reward yourself with your milestones. For example, treating yourself to a mani/pedi, massage, or a new pair of tennis shoes. Here are some gift ideas. If you’re looking for running gear, you can read some reviews on products here. We have also shared some of what we eat in a day in this post! All of these adorable workout pieces can be found at Nordstrom. We love the super cute pieces they have and all of the color options they have because you can never have too many!